Initially I had a hard time finding a blog site that I found credible, useful, and most importantly, not riddled with advertisement fodder. After quite a bit of hopping around, I finally found a site that was extremely visually appealing, well organized, easy to navigate, and chock full of great information. 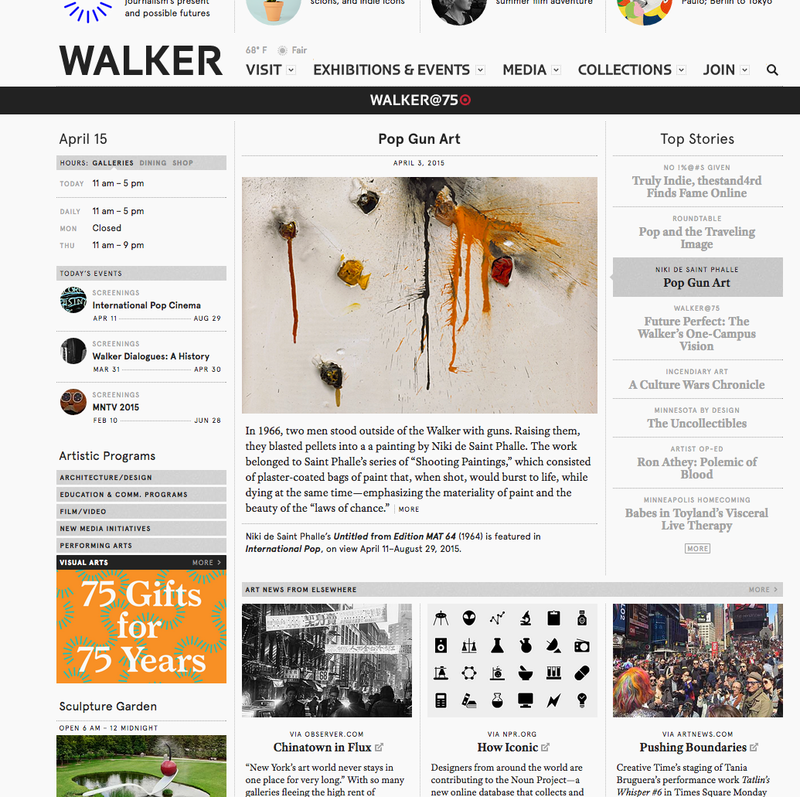 My chosen site represents the Walker Art Center in Minneapolis, Minnesota and is located at http://www.walkerart.org/. The Walker Art Center is an Institution of Education and exhibits all different forms of art ranging from music, dance, theater, film, paintings, sculptures, photography, and others. My specific area of interest and focus for my search was blogs about film and directing. I found the related information I sought more specifically at http://blogs.walkerart.org/filmvideo/. What a beautiful website! The homepage launched a really awesome video when I landed on it and all of the different buttons that link you to blogs and articles have animations and pictures. I tried my best to detach from my love of shiny things and approach this website with some scrutiny but it was very difficult. There is just so much cool stuff to read and learn about. The Walker Center constantly has events going on as the calendar on the website shows. The film blog has some great posts on it, all with attached images and video. Some posts were very brief blips about a new independent film being shown, and others were extensive college level conversations discussing a films deeper meanings and complex natures (whatever I just said). All of the blog authors are noted and most of their names are direct links to Bio’s on each of them. The websites entire blog section is very expansive and well organized (as shown in the image above). Some blogs have direct titles that are self explanatory of the content, while others have titles that are not immediately recognizable without giving some thought or clicking and exploring. I believe the website itself to be an excellent resource and source of inspiration as well, however some exceptional resources worth noting are it’s library database link, thousands of high quality images, and plethora of historical art information. This entry was posted in Sp15-P3 Blog Search on April 16, 2015 by richrobison83. Thanks for turning me onto a new website. I spent quite a bit of time looking around thanks to the film/video blog you linked to. Okay for this assignment I chose to reply to Lynne, Alden, and Christa. Nice blog post, I like the details you included. They do have a nice website, I agree!